Recent happenings have strongly reminded me of the post offices oath . . . "Neither snow nor rain nor heat nor gloom of night stays these couriers from the swift completion of their appointed rounds. In my world it would apply to last month’s tea events and would have to be revised to say, “Neither earthquake, rain, nor flooding nor disrupted train service stays this tea fanatic from the steeping of the leaf and savoring the liquor.” We, in Central Pennsylvania experienced an earthquake, hurricane Irene, and nonstop rains and flooding from Tropical storm Lee all within less than a month. During this time I was busily preparing for World Tea Expo East in Philadelphia from September 9 through the 11, 2011 – just at the time that the flooding would be at the peak. My World Tea Expo East agenda consisted of a black tea tasting with Beth Johnston (Teas Etc. ), a tasting of blended teas with Mim Enck, (East Indies Teas), a Meet and Greet for the Mid Atlantic Tea Business Association (MATBA) and the finale a tasting of Taiwan teas with Thomas Shu (ABC Tea). All of these a “must attend” for any tea enthusiast let alone one as fanatical as I am. So, I am embarrassed to say – but still did it – I abandoned my husband and puppies to fend for themselves. Actually leaving a day earlier than planned – to be sure I would get to Philadelphia by train. Instead of the train going clickedy - click, clickedy - click” I heard “cuppa - tea, cuppa - tea.” The least of my thoughts being, how will I get home in two days! 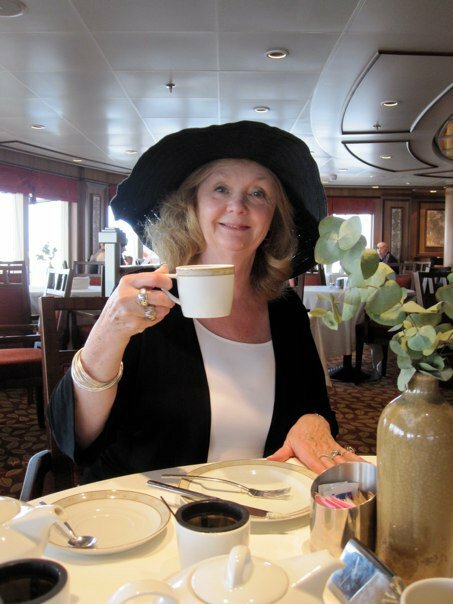 I was absolutely sure the “tea spirit” would handle any inconvenience traveling could hand me - - - and she did!